Western New Guinea is the western half of the island of New Guinea. It is internationally recognized as Papua, a province of Indonesia, and was previously known as Netherlands New Guinea (until 1962), West Irian (1962 – 1973), and Irian Jaya (1973 – 2000). Those who do not recognize the legitimacy of Indonesia's claim to Papua refer to the area as West Papua. Papua was annexed by Indonesia under the controversial Act of Free Choice in 1969. 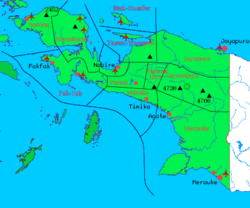 In 2003, the Indonesian central government declared that the province would be split into Papua Province, Central Irian Jaya Province, and West Irian Jaya Province. Opposition to this resulted in the plan for Central Irian Jaya province being scrapped. A central east-west mountain range dominates the geography of New Guinea, and is more than 1,600 km in total length. The western section is nearly 600 km long and 100 km across. Steep mountains 3,000 to 4,000 meters and up to 5,000 meters high along the range serve as a barrier to the prevailing winds and ensure a steady supply of rain. The tree line is uniformly at almost 4,000 meters and the tallest peaks are snowbound all year. On both the north and west sides of the central ranges the land is mountainous. The peaks are mostly 1,000 to 2,000 meters high and covered by thick rainforest. The climate is warm and humid year round. The third major habitat feature is the south east lowlands with their extensive wetlands stretching for hundreds of kilometers. The province has 40 major rivers, 12 lakes, and 40 islands. The Mamberamo River, sometimes referred to as the "Amazon of Papua," winds through the northern part of the province, creating a large area of lakes and rivers known as the Lakes Plains region. The famous Baliem Valley, home of the Dani people, is a tableland 1,600 meters high in the midst of the central mountain range. Carstensz Pyramid (Puncak Jaya) is a mist-covered limestone mountain peak towering 4,884 meters above sea level. A vital tropical rainforest with some of the world's tallest tropical trees and vast biodiversity, Papua's known forest fauna includes marsupials; possums, wallabies, tree-kangaroos, cuscus, and other mammals including the endangered long-beaked echidna. Many bird species including birds of paradise, casuarius, parrots, and cockatoos are found on New Guinea. Also found there are the world's longest lizards (Papua Monitor lizard) and some of the world's largest butterflies. The island has an estimated 16,000 species of plants, 124 genera of which are endemic. The extensive waterways and wetlands of Papua are also home to salt and freshwater crocodile, tree monitor, flying foxes, osprey, bats, and other animals; while the equatorial glacier fields remain largely unexplored. Ecological dangers to Western New Guinea include deforestation, which is occurring there at an alarming rate. The unchecked spread of the exotic crab-eating macaque monkey now threatens the existence of many native species. Pollution such as the Grasberg Mine dumping 190,000 tons of copper and gold tailings into the rivers system is endangering the entire ecosystem of the island. The border with the independent sovereign state of Papua New Guinea to the east is a mix between the artificial border of the 141st meridian and the natural border of the Fly River. This border is largely unguarded, and has seen a dramatic number of refugees crossing over to PNG to flee the Indonesians. There are no reliable estimates on how many have crossed. Jayapura, founded in 1910 as Hollandia, by 1962 developed into a city with modern civil, educational, and medical services. When Indonesian administration became dominant, these services were replaced by Indonesian equivalents such as the TNI (military) replacing the Papuan police force. 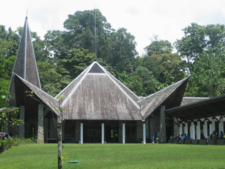 It is the largest city in Western New Guinea, boasting a small but active tourism industry. It is a neat and pleasant city built on a slope overlooking the bay. Cendrawasih University campus houses the Jayapura Museum. Tanjung Ria beach, well-known to the Allies during World War II, is a popular holiday resort now with facilities for water sports. General Douglas MacArthur's World War II quarters are found there still intact. Papuans, the native people of New Guinea, are a Pacific Melanesian people, as are those of the Solomon Islands, Vanuatu, New Caledonia, and Fiji. Papuans have inhabited the Australasian continental island of Papua for over 40,000 years, while Austronesians have been there for several thousand years. It is believed that the first Europeans to sight New Guinea were the Portuguese, but it was the Dutch vessel Duyfken which first recorded its travel along the southern coast of Papua in 1605, before sailing south into the Gulf of Carpentaria, landing in northern Australia. In 1828, the Dutch claimed the south coast west of the 141st meridian, and in 1848 added the north coast west of Humboldt Bay. The Netherlands established trading posts in the area after Britain and Germany recognized the Dutch claims in treaties of 1885 and 1895. At that time, Britain claimed southeast New Guinea later known as the Territory of Papua and Germany claimed the northeast, later known as the German New Guinea. In 1923, the Nieuw Guinea Beweging (New Guinea Movement) was created in the Netherlands by ultra right-wing supporters calling for Dutchmen to create a tropical Netherlands in Papua. This effort failed as most returned to Java disillusioned, and by 1938, just 50 settlers remained near Hollandia and 258 in Manokwari. In the early 1930s, the need for a national Papuan government was discussed by graduates of the Dutch Protestant Missionary Teachers College in Mei Wondama, Manokwari. These graduates succeeded in cultivating a desire for a national unity. The College Principal Rev. Kijne composed "Hai Tanahku Papua" ("Oh My Land Papua"), which in 1961 was adopted as the national anthem. In 1942, the northern coast of Western New Guinea and the nearby islands were occupied by Japan. Allied forces expelled the Japanese in 1944, and with Papuan approval, the United States constructed a headquarters for Gen. Douglas MacArthur at Hollandia (now Jayapura) and over 20 U.S. bases and hospitals were intended as a staging area for operations against the Japanese in the Philippines. Western New Guinean farms supplied food for the half million U.S. troops. Papuan men went into battle to carry the wounded, acted as guides and translators, and provided a range of services. The Dutch retained possession of Western New Guinea from 1945. Indonesian leaders Mohammad Hatta and Sukarno had declared Indonesian independence weeks before and claimed all Dutch territories in the area. The dispute continued until the (Western New Guinea) Round Table Conference, which was held from August to October 1949 at The Hague. Unable to reach a compromise, the conference closed with the parties agreeing to discuss the Western New Guinea issue within one year. In 1952, the Netherlands recognized Papuan self-determination as a right in accordance with Article 73 of the United Nations charter and began preparing the nation for independence. After repeated Indonesian claims for possession of Dutch New Guinea, the Netherlands invited Indonesia to present its claim before an international court. Indonesia declined the offer. Concerned that invasion might be a possibility, Holland accelerated its education and technical programs in preparation for independence. A naval academy was opened in 1956, and Papuan troops and naval cadets began service by 1957. Local council elections were held and Papuan representatives elected during 1959. In May 1961, an elected Nieuw Guinea Raad (New Guinea Council) became the first Papuan parliament and was responsible for implementing independence by 1971. The council selected the national anthem, selected a national flag, and decided the country's name would become "West Papua." The Dutch recognized the flag and anthem on November 18, 1961, and these ordinances came into effect on December 1, 1961. 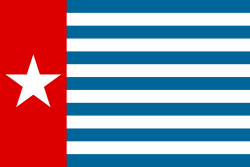 The Morning Star flag was raised on December 1, 1961, an act which Papuan independence supporters celebrate each year at flag raising ceremonies. The date for independence of Netherlands New Guinea was set for 1970. Indonesia paratroopers invaded on December 18, 1961, to be quickly arrested. There was a minor naval battle on January 19, 1962. But in the "New York Agreement," of August, 1962, the Netherlands surrendered West New Guinea to Indonesia. The Australian government, which had supported Papuan independence, reversed its policy. The agreement, ratified in the United Nations on September 21, 1962, stipulated that authority would transfer to a United Nations Temporary Executive Authority (UNTEA)]] on October 1, and that UNTEA would hand the territory to Indonesia on May 1, 1963, until such time as a UN-conducted "Act of Free Choice" vote could be held. The Indonesian government disbanded the New Guinea Council and forbade the use of the new flag or the singing of the national anthem. Indonesian occupation has been resisted through civil disobedience, such as Morning Star flag raising ceremonies, and through the formation of the Organisasi Papua Merdeka (OPM, or Free Papua Movement) in 1964. The movement's military arm is the TPN, or Liberation Army of Free Papua. Amnesty International has estimated more than 100,000 Papuans have died as a result of government-sponsored violence against West Papuans. In 1969, Indonesia conducted the "Act of Free Choice," mocked by dissenters as the "Act of No Choice." Before the vote, the Indonesian military detained for one month a large group of Papuan tribal leaders. The Papuans were threatened at gunpoint to vote to continue Indonesian rule. Assembled troops and two Western observers witnessed the vote, but the observers left after witnessing the first two hundred (of 1,054) votes. With the U.S. embroiled in the Vietnam War and concerns about the potential rise of communism in Southeast Asia, the U.S. and other Western powers ignored protests. Indonesia formally annexed the territory in August 1969. Indonesia accelerated a migration program, under which 1.2 million Javanese and Sumatran persons streamed into Papua over a 10-year period. Nearly all were Muslims, coming into an area that, prior to Indonesian rule, had been almost entirely populated by Roman Catholics, Protestants, and people following tribal religions. The purpose was to change the West Papuan population mix from mostly Melanesian toward a more Asian "balance," thus further consolidating Indonesian control. A separatist congress call for independence in 2000 resulted in a military crackdown. In 2000, Papua gained a "special autonomy" status, an attempted political compromise between separatists and the central government. A now-majority Islamic population was given limited autonomy in 2001. The region was divided into Papua and Irian Jaya Barat soon after President Wahid was impeached and replaced by Vice President Megawati Sukarnoputri. In January 2006, 43 refugees landed on the coast of Australia and reported that the Indonesian military was carrying out a genocide in Papua. The refugees were sent to an Australian immigration detention camp on Christmas Island, 2600 km northwest of Perth, and 360 km south of the western head of Java. On March 23, 2006, the Australian government granted temporary protection visas to 42 of the 43 asylum seekers. The next day, Indonesia recalled its ambassador to Australia. Western New Guinea comprises two of Indonesia's 33 provinces. Papua's special status gives it more autonomy from the central government than other provinces. Each of Indonesia's provinces is subdivided into regencies and cities, which are in turn split up into sub-districts. Indonesia is a republic with a presidential system, and a unitary state with power concentrated with the national government. Although names and areas of control of these regional structures can vary over time in accord with changing political and other requirements, in 2001, former Irian Jaya Province consisted of 12 regencies (kabupaten), one city (kotamadya), 117 subdistricts (kecamatan), 66 kelurahan, and 830 villages (desa). The economy of Western New Guinea is undeveloped, and the great majority of people produce only enough food to satisfy immediate needs. The people subsist by hunting, fishing, and cultivating bananas, corn, manioc, sago, yams, and other crops. In 1935, the Dutch Shell group formed NNGPM to explore West New Guinea, however the Standard Oil group gained 60 percent control through Standard Vacuum Oil Co. and Far Pacific investments. In 1936, NNGPM found the world's richest gold and copper deposits in the mountains near Timika. Unable to license the find from the Dutch or indigenous landowners, NNGPM maintained secrecy of the discovery. In 1959, the New York Times reported that the Dutch government had discovered alluvial gold flowing into the Arafura Sea and was sending an exploration team. In January 1960, Freeport Sulphur signed a contract with the East Borneo Company to mine Western Papua. In 1977, construction of the world's largest copper and gold mine began. Under an Indonesian agreement signed in 1967, the U.S. company Freeport-McMoRan Copper & Gold Inc. holds a 30-year exclusive mining license for the region from the official opening of the mine in 1981. The island has few large plantations, on which cocoa, coffee, and copra are produced for export. The indigenous people of West Papua are of the same ethnic origin as those in the eastern half of the island of New Guinea and are also related ethnically and culturally to other Melanesian peoples of the Pacific. The combined population of the Indonesian provinces of West Irian Jaya and Papua, constituting all of Western New Guinea, was estimated to be 2,646,489 in 2005. 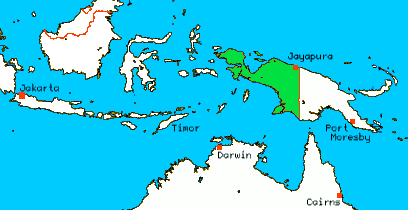 The two largest cities in the territory are Sorong, in the northwest birdhead region, and Jayapura, in the northeast. Both cities have a population of approximately 200,000. Western New Guinea is home to around 312 different tribes, including some un-contacted peoples. The following are some of the most well-known: Dani, Mee, Kamoro, Amungme, Sentani, Biak, Bauzi, Asmat, Kombai, Korowai, and Yali. Each has its own language and culture. There are over three hundred languages and two hundred additional dialects in West New Guinea alone. The highlands are densely populated regions, where bigger tribes such as the Nduga and Amungme live and survive by shifting between cultivation and hunting. As in Papua New Guinea and some surrounding east Indonesian provinces, a large majority of population is Christian. In the 2000 census, 54 percent of West Papuans identified themselves as Protestant, 24 percent as Catholic, 21 percent as Muslim, and less than 1 percent as either Hindu or Buddhist. There is also substantial practice of animism among the major religions, but this is not recorded by the Indonesian census. West Papuan culture was repressed under Indonesian rule since 1963. Only in 2001 was Papua Province granted special autonomy by the Indonesian government, opening the possibility of developing indigenous cultural production and arts venues. However, in March 2003, John Rumbiak, West Papua's famous human rights investigator, stated that Papuan culture "will be extinct," within 10 to 20 years if the present rate of assimilation in the region continues. The Indonesian government states that the special autonomy arrangement specifically addresses the ongoing preservation of Papua culture, and that the transmigration program was "designed specifically to help the locals through knowledge transfer." During the 1960s, the region had its own postage stamps. The first were overprints reading UNTEA (United Nations Temporary Executive Authority) applied to the stamps of Dutch New Guinea, issued in 1962. There are four slightly different types of overprint, three types applied locally, and a fourth made in the Netherlands and sold by the UN in New York City. These were superseded on May 1, 1963, by stamps of Indonesia overprinted "IRIAN BARAT" and a series of six commemoratives whose designs included a map of Indonesia stretching "from Sabang to Merauke" and a parachutist landing in New Guinea. These, as were later issues in 1968 and 1970, were inscribed both "IRIAN BARAT" and "REPUBLIK INDONESIA." The last issue specifically for the territory consisted of two depicting birds (Black-Capped Lory and Bird of Paradise), issued October 26, 1970. History of "Western New Guinea"
This page was last modified on 8 August 2013, at 13:52.